Seven Celtics scored in double-figures as they took down the Wizards 107-96 on Friday night. Bradley Beal was terrific yet again, scoring 29 points on a night where every other Wizard struggled to put the ball in the basket. Everyone knew tonight’s game tipped off at 8 pm Eastern. I knew, you knew, the fans knew, but for some reason, the Wizards didn’t play like they knew. Just like in Brooklyn the other night, the Wizards were ice cold from the field to start the game. They missed their first ten field goal attempts and quickly found themselves in a 13-2 hole. It was one of Washington’s worst quarters of the season offensively as they shot just 7-of-23 from the field with players not named Bradley Beal going 3-of-15. The Wizards found their legs in the second quarter and got back in the game, turning Boston turnovers into easy transition buckets. Washington looked to run on every Boston live-ball turnover, which led to 21 transition points in the first half. Somehow, someway, the Wizards went into halftime only down by four points after what felt like a blowout for most of the half. The Celtics made their first four shots of the second half and looked like they might open this one up but once again, Bradley Beal kept Washington in it with 11 points in the third period to keep Washington within striking distance and made it a one-point game at the end of the quarter. Boston started the fourth quarter by connecting on just one of their first five shots, but the Wizards bailed them out with their own dry spell. They committed four turnovers on four straight possessions and went 4:40 without a field goal in the fourth quarter. The Celtics went on an extended 21-7 run to pull away and didn’t look back. Washington only mustered up 15 points in the fourth quarter as they suffered their fifth loss in six games. What more is there to say about a guy who probably just had the best month of his career averaging 30 points per game in February? Beal was outstanding yet again tonight with 29 points to go along 11 rebounds and six assists. If it weren’t for Beal’s performance, this one would have gotten ugly and quickly as he was the only Wizards player who was a consistent scoring threat tonight. This was Beal’s 16th straight game of at least 20 points. Just like in Brooklyn Wednesday night, the Wizards came out without an ounce of interest in playing. Washington missed their first 10 shots of the night and found themselves in a 13-2 hole in a blink of an eye. It wasn’t because Boston was playing stellar defense or anything, Washington just couldn’t buy a bucket. Wide open threes clanked off the rim, midrange jumpers fell short, and even layups were a problem for the Wizards early on as they didn’t record their first field goal of the game until the 6:15 mark of the period. The Wizards trailed the Celtics by 15 in the first quarter and if Boston wasn’t coughing the ball up as frequently as Washington, this one could have been a lot uglier. Bradley Beal scored 10 of the Wizards’ 20 points on 4-of-8 shooting in the period but the rest of the squad combined to shoot just 3-of-15 from the field and 1-of-7 from three-point range. Just by looking at the box score, you’d think Washington had their way in transition. And they did, sort of. The Wizards scored 26 fast break points tonight (21 in the first half) but will now be referred to as leak-out points, because that’s what they were. Washington clawed their way back in the first half (by design or not) by having a guy leak out in transition when Boston put up a shot. Washington wasn’t playing great defense in the first half but the Celtics were loose with the ball which the Wizards turned into easy leak-out dunks. The Wizards only had five transition points in the second half but regardless, it’s usually a good night when you get 26 points on counter attack opportunities. Next up: The Wizards (25-37) return home to host the Minnesota Timberwolves (29-33) on Sunday at 6 pm Eastern Time. From the moment John Wall, Bradley Beal, and Otto Porter were put together on the Wizards, there was an expectation the core could reach the Eastern Conference Finals. In 2017, they got within 15 minutes of reaching it. They were leading Game 7 of the Eastern Conference Semifinals with under 3 minutes left in the third quarter when everything fell apart. Washington’s bench crumbled, Kelly Olynyk caught fire, and the Wizards’ starters ran out of gas. There were still reasons to be optimistic after that crushing loss. Wall and Beal had turned in their best seasons to date, and the front office made it clear that keeping the group together was a priority. The Wizards’ Big 3 was ready to carry the mantle as the most promising professional D.C. sports team and write their chapter in the D.C. sports history books. Little did we know the core would dissolve less than two years later having got no closer than they did on May 5, 2017. Blame it on the injuries, a lack of leadership, missteps from the front office — the list goes on and on. But, rather than building on the momentum of Washington’s best season in 40 years, they took a major step back last season, followed by an even bigger step back this season. Things were so bad between the team’s underperformance and John Wall’s Achilles injury that the Wizards traded Otto Porter in a luxury-tax dodging move, just days after assuring him they’d keep him through the trade deadline. With the Wall-Beal-Porter era now abruptly over, how will we look back at this five-year window once the dust settles? It’s tricky. The Wizards burst onto the scene a year early. The upstart backcourt of Wall and Beal, together with proven veterans sprinkled in at key spots, slid into the 5-seed in 2014. After a surprising 4-1 series win over the heavily favored Chicago Bulls, they faced the top-seeded Indiana Pacers. Washington, a significant underdog was playing with house money. They already overachieved in winning a first-round series when many thought just making the playoffs would be a success. Their two victories against the Pacers were the cherry on top of a pleasantly surprising season. The team’s bright future lured free agent Paul Pierce to D.C. on a one-year deal that summer. His arrival gave the team a legitimacy it had lacked. Their first-round sweep of the Raptors in 2015 followed with a back-and-forth series against the top-seeded Atlanta Hawks solidified the Wizards as a team that would be a factor in the Eastern Conference for years to come. The NBA was on notice — Washington was a legitimate threat in the East. However, in the Wizards’ minds, they already viewed themselves as part of the club. They were confident things would have ended differently if John Wall didn’t break his wrist in that series, and the team spent the rest of the summer trying to tell everyone about it before they could prove it. It was the summer Wall and Beal talked about being the “best backcourt in the NBA.” The Wizards were no longer the overlooked underdogs, they were the team that had to go out and back up their boasting to the league. With Paul Pierce gone, the Wizards brought in Jared Dudley to be a positive locker room presence even though Wall and Beal felt they were ready to lead. Inconsistencies, infighting, and injuries marred the 2015-16 season and provided a dose of reality for a team that thought it had arrived. After changing their coaching staff, and overcoming a 2-8 start to the 2016-17 season, it looked like Washington was back on its way to reasserting itself as a legitimate Eastern Conference contender. They won 49 games, John Wall turned in an All-NBA season, and Bradley Beal had a legitimate case to make the All-Star game that year. Once again, the Wizards grew tired of being the underdog and went back to trying to prove they could be more than what they had shown — the underlying theme of the era. The 2018-19 campaign has been a season from hell. The exciting underdog team from 2014 is a distant memory, and the front office is in panic mode hoping that they can clean up past mistakes and salvage their future with Wall in a walking boot and Porter in a Bulls uniform. The team that once dreamed of going toe-to-toe with LeBron in the Eastern Conference Finals is now patting themselves on the back after two straight wins against lottery-bound teams to keep their flimsy playoff hopes alive. This trio will go down as a core that collectively never fulfilled its potential. There are many reasons this big three never made it past the second round of the playoffs, including injuries. But ultimately, it was delusion from both the team and the front office that contributed most to Washington’s shortcomings. They convinced themselves they were close and didn‘t need to make major changes, when the reality is, they were much further away. Back in 2013, things looked so bright for the future. But now, as the era ends, the only thing that seems clear is that there will be a murky path ahead for the next era of Wizards basketball. Bobby Portis — yes, the Bobby Portis that the Wizards traded for on Wednesday — scored 30 points off the bench in his Washington debut as the Wizards took down the Cavs, 119-106 on Friday night. Bradley Beal turned in another outstanding performance with 25 points while the other newest Wizard, Jabari Parker got in on the fun with a near triple-double with 7 points, 11 rebounds, and 9 assists. Like we’ve seen many times this year, the Wizards had a ho-hum approach to start this game. They looked lifeless and didn’t get much energy from the crowd (can you blame them? ), but the game got turned upside down when the newest Wizards, Portis, and Parker entered the game. Parker hit his first shot as a Wizard, a corner three. Portis one-upped him by making his first 6 shots en route to a 16-point opening period. The spark from Portis and Parker carried over into the second quarter as the Wizards took a 66-52 lead into halftime. Then, Washington made three consecutive 3-pointers to open the second half on a 9-0 run. It looked like Washington might usher this game to a quick ending, but no lead is safe in Washington, regardless of who is donning a uniform for the team. Cleveland outscored Washington 29-15 the rest of the third quarter and cut the lead to four early in the fourth. Then, after missing his first seven three-point attempts, Trevor Ariza finally connected from three-point range to give the Wizards some breathing room. The next time down the floor, Tomas Satoransky drove into the lane and kicked it to who else, Bobby Portis, who knocked down the 3-pointer to get to 30 points on the night and shut the door on Cleveland’s comeback bid. Washington cruised the rest of the way to a 119-106 victory to end their two-game losing skid. How about that for a first impression? You know what they say, first impressions are lasting impressions. The former Bulls sent over in the Otto Porter trade had just about the best debut you could have hoped for against Cleveland. Portis looked tentative on his first possession in a Wizards uniform when he turned the ball over, but that’s about the only thing he did wrong this evening. He hit a floater in the lane midway through the first quarter that opened the floodgates. He had a pick-and-pop rhythm with Beal which led to a pair of open 3-pointers for Portis in the early going. He finally missed a shot in the second quarter but finished the half with a team-high 18 points on 7-of-8 shooting. Parker also had an impressive debut and got things going by knocking down a corner three just seconds after entering the game. He looked more hesitant to shoot compared to what we’ve seen in Milwaukee and Chicago, but he made it a priority to get his teammates involved early and often. He had seven first half assists, including a behind-the-back pass to Trevor Ariza for the dunk and foul. Beal started out the game slowly, as a scorer. He was a facilitator early on, getting six assists in the first quarter prior to attempting his first shot of the game late in the period. After putting up 12 points and nine assists in the first half, Beal went into scoring mode to start the second half. He connected on back-to-back three-pointers from the same spot as Washington started the period on a quick 9-0 run. He ended the evening with a near triple-double, racking up 25 points and 13 assists to go along with 6 rebounds. Next up: Portis and Parker will get a chance to show off their new uniforms in Chicago as the Wizards face the Bulls on Saturday at 8 pm Eastern Time. Let’s be real, no one thought the Wizards turned the corner when they went 7-3 after losing John Wall to a season-ending heel injury. But there was reason to think they turned a corner after winning 8 of their last 13 games. If nothing else, it looked like they had enough to sneak back into a playoff spot. On Tuesday, Washington looked just like the lottery-bound team they looked like for most of the first two months of the season in a 116-113 loss to the league’s worst team, the Cleveland Cavaliers. Although Washington only lost by three points, they spent most of the night down by double digits. They were in an 88-69 hole after three quarters of basketball which we are probably better off never speaking of again. The game only got interesting after Washington waived the white flag. Scott Brooks emptied the bench with 7:50 left after the Cavaliers took a 25-point lead. Two-way player and former Cavalier Jordan McRae poured in 15 points on a perfect 5-of-5 from the field and Gary Payton II added 11 as the Wizards went on a 33-14 run to put themselves in a position to force overtime. Washington had the ball down 3 with 11 seconds left. Brooks stuck with the reserve unit that brought them back into the game rather bring the starters back in for the final possession. He put the ball in rookie Troy Brown Jr.’s hands to make a play, but Cedi Osman knocked the ball away to keep Washington from extending the game any further. The arctic blast making its way through the Midwest felt like an apt metaphor for Washington’s offense in the first half. The final numbers aren’t nauseating thanks to Washington’s late rally, but it was just an ugly offensive performance following one of their best outings of the season on Sunday against the Spurs. The Wizards shot 39.5 percent (17-of-43) from the field in the first half and trailed 53-47 at halftime as a result. Bradley Beal and Trevor Ariza combined for 27 of Washington’s 47 points in the half and outside of Jeff Green who had seven, no other Wizards player scored more than four points in the half. On top of the poor shooting, the Wizards struggled to get to the rim. The Cavs outscored the Wizards 28-8 in the paint in the first half and had 11 layups or dunks, compared to just 3 for Washington. Remember how the Wizards looked much improved over the last few weeks on the defensive end? Yeah, we can stop all of that chatter. The defense was bad tonight, really bad. The Cavs came into this game averaging 102.4 points per game — and they cracked the 100-point mark just three minutes into the fourth quarter. This wasn’t about scheme, wasn’t about X’s and O’s, this was about effort — and the Wizards had none until it was too late. Ante Zizic and Cedi Osman bullied Thomas Bryant and Jeff Green from the beginning and Washington’s front-court duo didn’t have a response. To make matters worse, the Wizards didn’t have an answer for Jordan Clarkson either who scored 28 points tonight in a quasi-revenge game. This play sums it all up. Next up: The Wizards will try to get back on track against the Indiana Pacers on Wednesday at 8 pm. Oddly enough, Washington is much better on the back end of back-to-backs (6-2) then they are on the front end (1-8). Can’t chalk this one up to lack of effort. Steph Curry dropped 38 points on the Wizards Thursday evening as Golden State knocked off Washington, 126-118. All five Washington starters scored in double figures led by Trevor Ariza with 27 and Tomas Satoransky with 20, but it wouldn’t be enough as the Wizards just didn’t have the horses to keep up with Golden State. This one started out as a track meet. Both teams ran up and down jacking up three-point shot after three-point shot to open the game. It’s not always the smartest idea to try and run on a team who likes to run, but the Wizards took an early 14-11 lead. Washington slowly cooled off after that point while Golden State went 15-of-24 from the field in the opening period to take a 37-28 lead after one quarter. DeMarcus Cousins, who was playing in his third game back from injury, made his mark in this one starting in the second quarter as he took advantage of Washington’s undersized frontline. They could have folded, but they fought back and chipped away at the lead by forcing turnovers and creating opportunities in transition. Washington went into the locker room trailing 67-59, but had to feel good about keeping the game within reach for the first 24 minutes. The Warriors, being an excellent third quarter team, opened the second half up with a 17-10 run to take a 15-point lead. Curry, who scored 19 points in the first half, added another 14 in the third period. The Wizards cut the lead back down to single-digits briefly near the end of the quarter, but it felt that the Warriors had this one in hand with a 104-92 lead entering the fourth quarter. And that’s when things got awfully interesting. Washington’s three-point shooting picked back up in the fourth. Timely three-pointers from Ariza, Satoransky, and Chasson Randle got the Wizards within two, 108-106. After turning the Warriors over, Washington got out in transition where Randle found Sam Decker cutting to the rim for an open layup, but he missed it off the back of the iron. Golden State snagged the board and went on a 15-3 run after that missed layup to put the game out of reach. It was clear from the opening tip what the game plan was for Washington tonight — if they wanted to be competitive in this one, they’d have to let it fly from three. The Warriors came into this game as one of the best three-point shooting teams in the league and the Wizards tried to fight fire with fire. Washington jacked up 12 three-point attempts in the first quarter and 21 for the half, which was one of the main reasons the Wizards stayed within striking distance early. The Warriors would go on their inevitable third-quarter run to stretch the lead out to 15, 84-69. But once again, it was Washington’s three-point shooting that got them back in this one. Tomas Satoransky, Trevor Ariza, and Chasson Randle all hit three-pointers as Washington trimmed the lead to two in the fourth quarter, 108-106. The Wizards shot 15-of-42 from distance tonight, but missed a few too many open looks to pull off the upset. No, he didn’t put up a career-high and points and no; it wasn’t a triple-double, but Satoransky had a great game and one of the best performances of his career. As mentioned, Sato had 20 points to go along with 10 assists and 3 rebounds tonight. Satorasnky oozed confidence and was Washington’s best player tonight. From the opening tip, Sato played like he belonged out on the court and the moment never got too big for him. He looked confident with his shooting stroke, made the right passes, and didn‘t get baited into the turnovers the Warriors kill other teams with most nights. It was great to see Satoransky — a player criticized early in his NBA career for being too passive and tentative — take charge against the best team in the league. He played with a gusto and confidence in the national spotlight that will catch people’s attention as he gets ready for free agency this summer. Otto Porter has been terrific off the bench since coming back from injury but he had his first dud of a shooting performance against the Warriors. He missed his first six shots of the game and ended the night going 3-of-14 for seven points and missing all seven of his three-point attempts. Chasson Randle was a pleasant surprise with 11 points in his reserve role tonight but you’re just not going to knock off the champs when your bench combines for just 20 points. Next up: Washington will be back in action Friday night as they travel to Orlando to take on the Magic at 7 pm Eastern Time. No one expected the Wizards’ season to go like this. Optimists thought this team was one puzzle piece away from catapulting themselves back into the top of the Eastern Conference. Pessimists thought even if things didn’t click, this team had too much talent and would be in playoff contention even if it was at a lower seed. In a season that alternates between going off the rails and powering through the NBA’s best teams, the only consistent has been inconsistency. Even with all the turmoil in D.C. and uncertainty about if the Wizards will be sellers or buyers at the trade deadline, Bradley Beal is quietly turning in the best season of his career to date. He got off to a slow start, like the rest of the team. He struggled on defense and only connected on 31.5 percent of this three-point attempts in November. 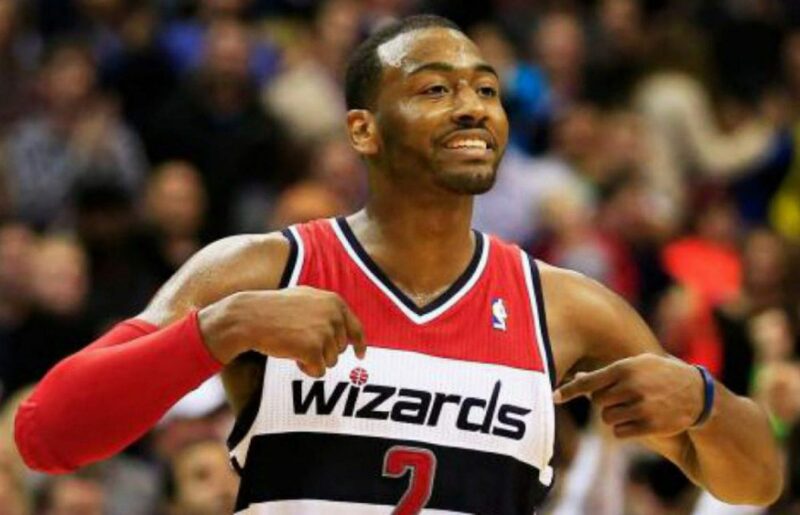 It led to rumblings from the Wizards faithful about whether he had lost his shooting touch. Things changed for Beal once the calendar flipped to December. As John Wall bounced in and out of the lineup, Beal‘s usage jumped from 23.9 percent to 28.6 percent. As his scoring increased, he also showed improvement as a facilitator, averaging nearly one full assist more in December than he did in November. Beal has rounded out his game to where he’s a legitimate threat on all points of the court — and he’s showing it nightly. Beal has scored at least 20 points in all but two games since the start of December. He‘s had seven 30-point games and two 40-point games in that span. Defenses have zeroed in on Beal even more in the last eight games after Wall went down for good, but he has responded by averaging 27.8 points, 5.4 assists, and 4.6 rebounds per game while guiding Washington to a 5-3 record. Brad is putting up the best numbers of his career and is logging a boatload of minutes, but his outstanding season is going unrecognized on a national level since the Wizards aren’t in the playoff hunt. As we know, the NBA All-Star Game is a popularity contest and that couldn’t be any more clear as guys like Dwyane Wade, Zach LaVine, Jeremy Lin, and Goran Dragic have more votes than Beal after the second round of the fan balloting. As it stands, the Wizards are in the 11th spot in the Eastern Conference, two games behind the eighth seed. It’s anyone’s guess whether the front office will make another desperation trade for a playoff push, or if Washington will be sellers come the trade deadline. But through all the noise and chaos in a season that has felt more like four seasons, Bradley Beal is turning in the best year of his career and is making a case for why he’s the best shooting guard in the league. It’s time to grasp how special this season has been for Beal as otherwise, it will probably go unnoticed amidst the rest of the chaos around surrounding the franchise.